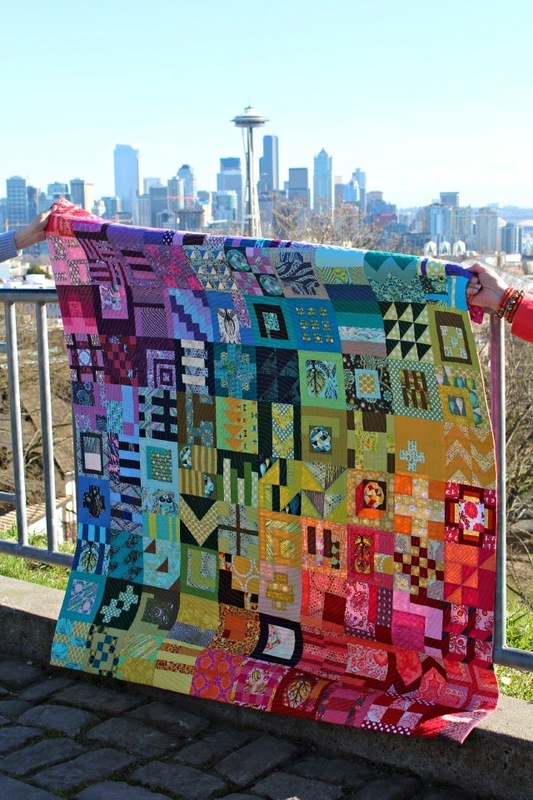 The most logical place for a photoshoot of a finished City Sampler quilt is of course the city. But as lovely a day as it was at Kerry Park on Seattle's Queen Anne Hill, it was also very windy. The quilt, unfortunately held upside down in the chaos, wrapped itself around us. We tried another tactic with some success . . . But seriously, it was WINDY! Down the road a bit, we found a quaint little garden, and had better luck. Nine months I've traveled to get to this day. Stitching page by page through Tula Pink's book, 3 blocks a week with the City Sampler Quilt Along. Rewarded big time by being selected by Tula herself as 2nd place winner in the quilt along contest, I really wanted to do this one justice. So I guess this is the last chapter for my City Sampler, "Unlocked". I knew at the beginning it would be an ambitious undertaking. Yet I can honestly say it was a thrilling adventure, and I'm pleased as can be with my finished sampler. The End. This quilt is on my Finish-A-Long 2014 Q1 list. Linking up with Fabric Tuesday. It's been lovely to see the progression of this project. Thanks for sharing your beautiful pictures. You must be so proud of this finish. 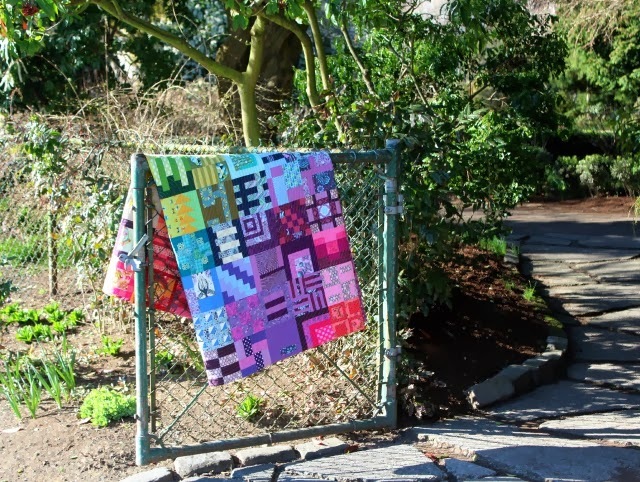 Such a gorgeous quilt and your photos are stunning too! The quilt is breathtaking.....so glad the spiral quilting tutorial was helpful. Such a gorgeous quilt!!!! Such a great quilt. Thanks for sharing all the pics. This turned out fantastic!! I love how you quilted it! Fabulous photos...I'm able to really admire that quilting. Tula chose well! Absolutely stunning! Congratulations on your award and your finish of this spectacular quilt! I went straight to the binding tutorial when you mentioned it. I love the look and will definitely try it. I often find that the binding detracts from quilts. Just like quilts without border - this is quilts without binding (sort of). Thank you for the tip. Despite the wind, your photo shoot of "Unlocked" are wonderful! As I said on Flick'r there are not enough superlatives to describe the beauty of this quilt! I would have liked to have seen it win first place! A stunning achievement Debbie! A real stunner!!! And the photo shoot does a goeat job in showing it off. Congratulations on the journey, I enjoy stretching my skills too. Spectacular, Debbie! I noticed the binding right away. At first, I wondered if you had changed binding colors to match, which you are so good at. Nicely done, my friend! I really love the way this turned out. The colors are great. and that spiral quilting is impressive! Nice! You have so much to be proud of. The quilt is beautiful. I am in awe. Maybe someday I can do something like that. You a perfect role model for me. The quilt, the story and the photos are all perfection. Beautiful quilt Debbie- you are super happy with it and you SHOULD be. Thank you for sharing yet another inspiring creation! Love Love Love now I need to really work on mine! It's fantastic! I love how rich the colours are and having the blocks right together works so well. It is a quilt to be proud of and your photos are beautiful too. It's simply gorgeous! It looks great with the facing and large block on the back. I think I may just have to say that this one is my absolute favorite to date! 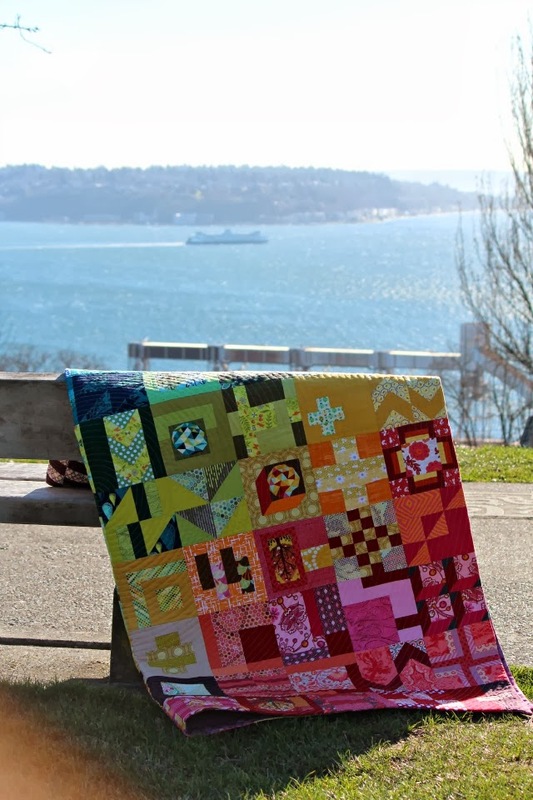 The quilting, the colors, everything...love, love, love it! Delectable! I'm savouring those divine colours on this cold winter day and admiring the beauty of all those blocks, Deb. An incredible finish and awesome photo shoot! It really is beautiful and you had a great photo shooting. Gorgeous quilt! Love the quilting design also! Congrats! 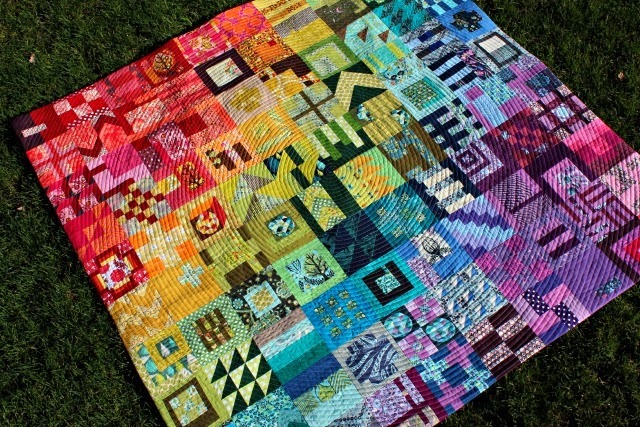 Oh Debbie this is such a glorious quilt and I really enjoyed reading your post about it! It appears you had a spirited outing for a spirited quilt ;o) I've never heard of "faced" binding before...learned something new! What wonderful photos!! The colors are fantastic with the back drop. This quilt is gorgeous. Thank you so much for sharing this with us. I love the city background in the photos. Oh. My. Goodness.! As someone else already stated, this is absolutely BREATHTAKING! What a treasure. I've just found your blog recently and look so forward to your posts and finishes. I love your style! Congrats on an award winner, for sure. This is such a beautiful quilt, and I'm pleased as punch about your second place award--you are so deserving. 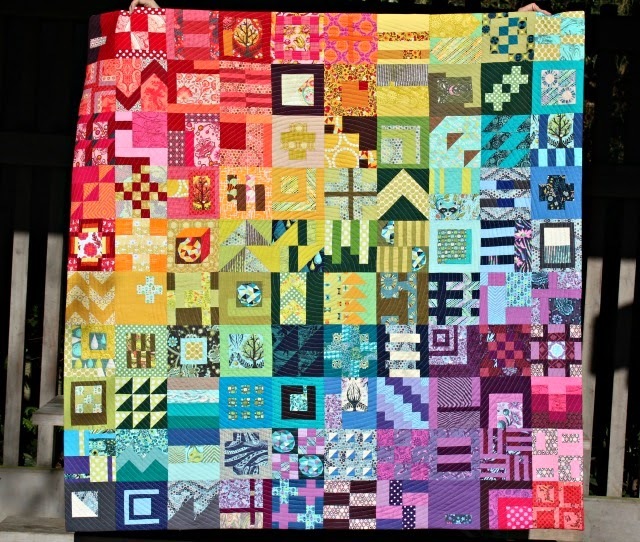 I have loved seeing the book explode with your blocks and now to see them nicely settled here into this gorgeous quilt. I think the faced binding compliments your work nicely (and thanks for link over). I love my two faced binding quilts--it really lets the work on the front shine. Again--a stellar accomplishment on all levels! This quilt is drop dead amazing. Debbie, what a stunnng day to do your City Sampler photo shoot! I love the concentric circle quilting you wound up doing. Congrats on 2nd and the completion of your journey with this quilt. It's so happy and bright and I want to curl up under it and read a book! I agree with exactly what Heidi posted above. It really is stunning! 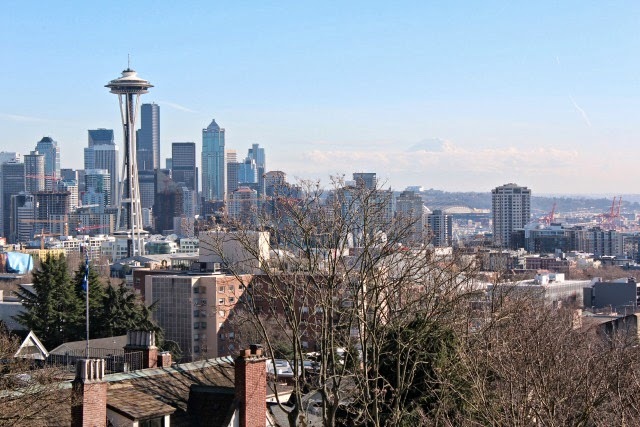 What a backdrop of Seattle in the photos. 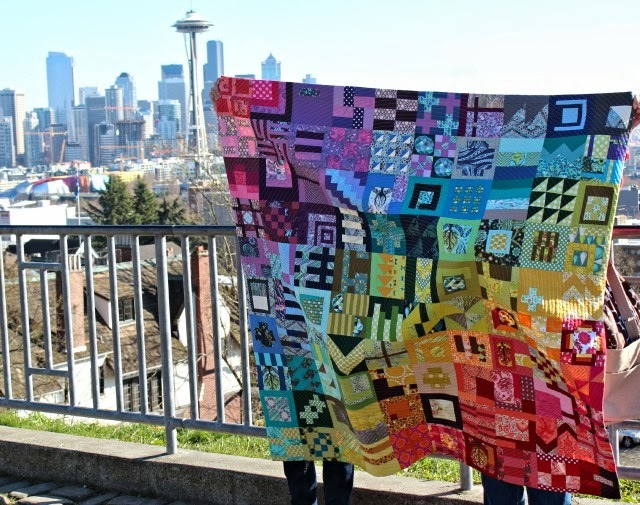 Even with the wind, the pictures are fantastic with an awesome quilt and a beautiful Seattle day! Amazing Debbie! 9 months - wow, it's like you had a baby! ;) The one really windy shot really shows that beautiful spiral quilting. I love it! Just gorgeous and I adore the quilting :) Great photo shoot! Congratulations. What an amazing undertaking. Turned out beautifully Debbie even if the wind didn't cooperate. Congrats on the 2nd place. Such a truly amazing quilt! The spiral quilting on it is money! All incredible and obviously a whole lot of work / fun to make. Thanks for showing it off! Love love love this quilt and the back,too! It's gorgeous! I love the colors, fabric, quilting and the back. It's a fabulous quilt! Wow! I am totally borrowing the idea for the back, when I get there... only managed one block on the wrong seam allowance so unpicked and back to square one... going to a retreat in May, it might just be the quilt I do there! What a fabulous quilt. I love everything about it--all the gorgeous colors, the quilting, the PHOTOS! Very well done. Love everything abut this quilt - the colour plan, the faced binding and of course, the quilting. It is a triumph. This turned out so beautiful Debbie! Way to go! 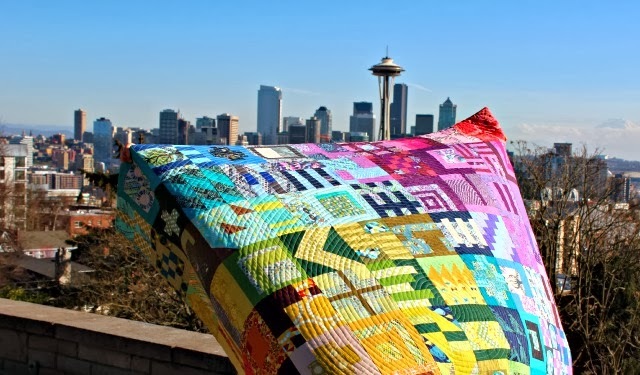 Beautiful photos of a beautiful quilt. Well worth the effort in the wind. Is Seattle often windy? I know the stereotype of it being rainy. I live on a very windy peninsula in South Australia where the wind is a constant. I'm proud of you! Nicely done Mom!